The RS Venture—one of a growing line of dinghies and sportboats from UK-based RS Sailing—has a great deal of space, boasting a huge cockpit that can carry up to 1,400 pounds of crew. The RS Venture—one of a growing line of dinghies and sportboats from UK-based RS Sailing—has a great deal of space, boasting a huge cockpit that can carry up to 1,400 pounds of crew. Payloads might include four adults plus four children cruising to the beach, six students coached by an instructor, two sailors having fun with the spinnaker, or a solo sailor, with room to spare. Despite being big for a dinghy, with an LOA of 16ft 4in and nearly 7ft of beam, the Venture has attractive lines with low freeboard tapering to a stylishly wide transom. The underside is very flat, which helps increase stability. Molded side benches and a rear tank under the tiller provide buoyancy and security when spray is filling the cockpit or when you are recovering from a capsize. In both instances, the shallow double-bottom with self-bailers and transom flaps is designed to clear water immediately. 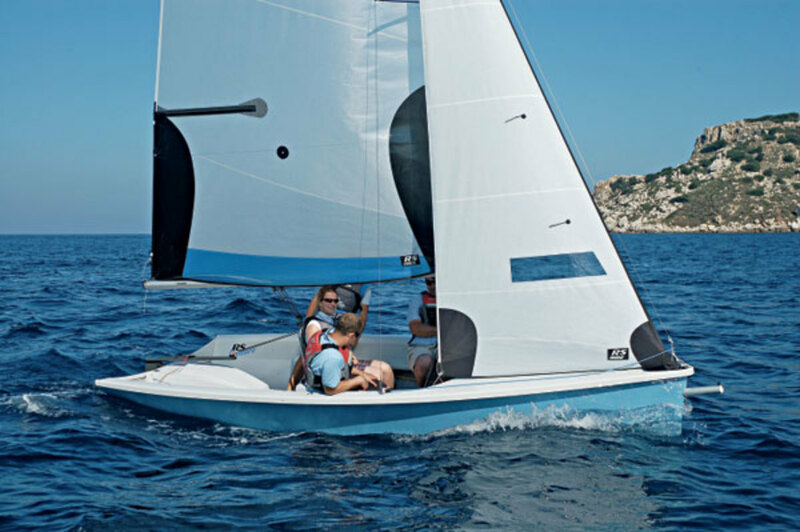 I was surprised to learn that the Venture is built in single-skin fiberglass, instead of being rotomolded, as is the case with the best-selling RS Vision and many other all-purpose dinghies. The reason for this, though, is a straightforward one. As boats get bigger, it becomes more difficult to make a rotomolded hull stiff and light. A fiberglass boat is also more responsive on the water, looks nicer and tends to wear better. You would normally want to launch and retrieve this boat on a solid ramp with a gentle angle. But for our test sail we had to push the Venture across soft sand—which was OK for three grown men, but would be tough for youngsters. Once afloat, the Venture is super stable. It’s also really easy to move around in, with little for novices to trip over and plenty of places to sit. A strut-vang above the high boom ensures there is plenty of room just aft of the mast, and the mainsheet runs to an aluminum horse just forward of the tiller so beginners won’t get tangled up during tacks and gybes—both great features for a sail-trainer. Our test boat was fitted with a furling jib, which seems a very worthwhile addition. There was also an asymmetric spinnaker for extra fun downwind. 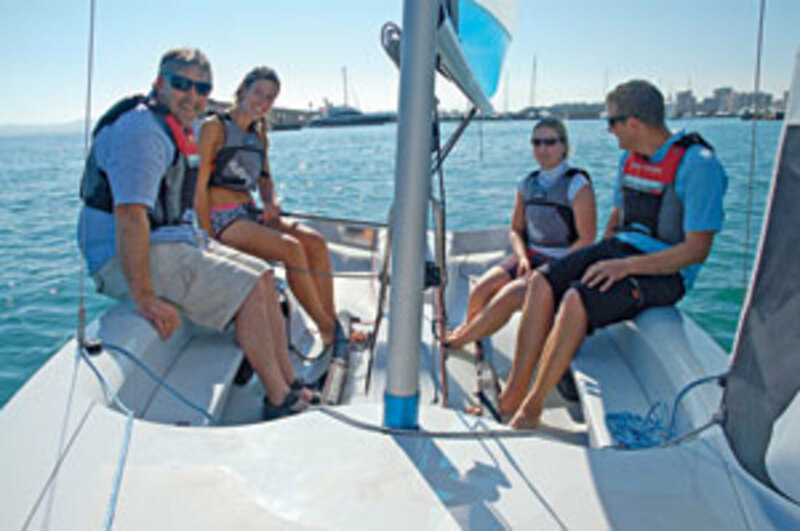 Factory-fitted rubber gunwales are an option that will certainly be useful for sailing schools. I was impressed by the long, slim aluminum rudder, which has a replaceable plastic tip, and the simple fiberglass centerboard. Sailing in wind around 9-14 knots, the Venture was great with just two sailors. She took off in gusts, felt responsive, powered upwind, and broad-reached quickly downwind with the asymmetric spinnaker, all the while being very easy to control. If you want to cut power, single-line reefing reduces the mainsail to 98ft2. If you want auxiliary power, a small outboard can be fitted. It’s also not a big problem if you manage to capsize this ultra-stable boat. The Venture floats low on its side and has foam inside the mast to keep it from turning turtle. It’s easy to clamber on the wide centerboard and, with help from the righting line, surprisingly easy to pull back upright so you can enjoy more trouble-free sailing.